Islamists militants in Libya have probably kidnapped up to 25 soldiers and killed five others in the eastern city of Benghazi, an army commander said yesterday, as the prime minister travelled to the United Arab Emirates to seek support for his embattled government. Prime Minister Abdullah al-Thinni has called for the international community to help fight terrorism in the oil-producing country, which has slid towards anarchy three years after the fall of Muammar Gaddafi. Last month, the capital, Tripoli, fell to an armed group, forcing the elected Parliament to relocate to the remote eastern town of Tobruk. In Benghazi, Islamist fighters have been trying to seize the city’s civilian and military airport. 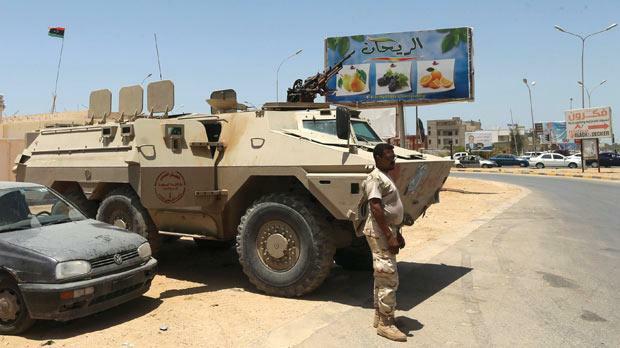 Five soldiers were killed and seven others wounded when Islamist fighters belonging to a group called Majlis al-Shoura attacked an army checkpoint in Benghazi on Tuesday, Fadhil al-Hasi, a special forces commander, told Reuters. Majlis al-Shoura refers to an alliance of Islamist fighters in Benghazi that includes Ansar al-Sharia. Washington says the group was behind the attack on the US consulate in Benghazi two years ago in which the American ambassador was killed. “Twenty-five soldiers are missing,” Hasi said, adding that Islamists had most likely abducted them at checkpoints. To get support for his government, Thinni flew from Tobruk to the UAE, a country that has cracked down on Islamists. Part of the armed group from the western city of Misurata controlling Tripoli is Islamist-leaning. “We are asking the international community to stand by us in fighting terrorism. This is the support we need,” he told reporters in Abu Dhabi. Nato and Arab countries have been training Libyan soldiers since the toppling of Gaddafi, but regular forces are often no match for armed groups battle-hardened from the 2011 uprising. Thinni said the UAE was supporting Libya, without elaborating. US officials have said the UAE and Egypt, which also has cracked down on Islamists, bombed positions held by Misrata fighters days before they seized the capital last month. Thinni denied this. He said the UAE had arrested seven Libyan nationals, some of whom Libyan media have said had links to the Muslim Brothers. “We respect the sovereignty of other countries like we respect ours. We don’t accept our citizens to interfere in the domestic” affairs of other countries, Thinni said when asked about the arrests.